Collaboration: It’s the latest buzzword; the thing that all clients want to incorporate into their workspaces. There are numerous articles and research papers detailing the benefits of collaboration in the modern workplace, but what do we really mean when we talk about collaboration, and how do we best design the overall work environment to support this type of activity? What constitutes a collaborative workspace is sometimes ambiguous. We know it is meant to define a place in which two or more people work towards achieving a common goal. Many times, clients ask for spaces in which their employees can “go to” to collaborate. This generally means that they want distinct spaces in which occupants can innovate, discuss initiatives in small groups, and generate ideas. 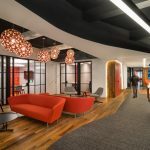 As designers, we see this as an opportunity to solve the client’s problem; a chance to build in some shared spaces beyond the dedicated, individualized workspaces that make up the majority of a floor. But once the space is built, the most common observation is that the designated collaboration spaces are under-utilized or not being used as they were intended. This may be due to a variety of factors: poor circulation through and around the spaces, inappropriate size and quantity allocations, or cultural issues between management who had input on the design and the employees who are actually using the space. Whatever the case, these issues indicate that the design is not properly supporting how the employees actually work on a daily basis. For the most part, these secondary shared “collaboration” areas outside of the primary workspace are still a positive addition to a work environment. They help promote the casual interactions that prove to be the most fruitful in terms of idea generation. They also increase the socialization of an office environment, not to mention the added health benefits for employees who are up and moving around the greater workspace over the course of a day. There is no need to do away with these spaces simply because they are often perceived to be inefficient. But by understanding the types of work and behaviors that drive people to use them, designers can make more appropriate decisions, and equip their design with the technology and furniture that supports the work occurring in the space. Look beyond these secondary spaces: in most work environments, you’ll see plenty of one-on-one or two-on-one conversations happening at the primary, individual workspace. In fact, some studies show that the majority of collaboration actually happens at the primary workspace. If we begin to consider everything in the physical work environment as a collaborative space, the challenge lies in being able to distinguish the activities occurring in primary and secondary workspaces in order to design an appropriately supportive environment. Freeing ourselves as both designers and clients from associating the term “collaboration” with an actual space type can allow us to better understand the types of work and employee profiles that we are designing spaces for. Designing spaces that support the functions that are intended to happen within them should be the ultimate goal. “Collaboration” has enjoyed a long run as a buzzword, but as a result it’s lost some of its impact. It has devolved into a term to describe any type of interaction. The focus should be on designing spaces that support the behaviors and resultant activities that are occurring within the overall physical workspace. If we start discussing collaboration in terms of what it actually is — a behavior — rather than associating it with a type of space, we will be better prepared to design physical space that supports the specific worker types that are using the space. Assuming that every area within the workplace has some capacity for collaboration lets us reach beyond the term to outline the other specific interactions that need to be supported. Defining these interactions can help us to recognize the primary, secondary and tertiary spaces that should be programmed into a working environment. Thinking of collaboration as a behavior, rather than a specific space type allows us to parlay it into the organizational behavior side of our client’s work and better understand their culture and change management needs. How do people behave in their physical workspace now and how will this change in the future? How does the physical workspace influence collaborative actions such as one on one interaction, two, three, and four-person meetings as an example? What types of technology and furniture can be supportive of these specific actions? Drilling down into these questions is truly the only way to understand the behaviors that create an effective office and design a space that is supportive of such actions. Designing for the often layered and varied existing or intended culture of a client requires us to understand their levels and types of interaction, whatever they may be. I really like the approach proposed by this article, but not clear on what the structured method would be to approach the design of a space this way. Observe needs in an existing workspace? Make an inventory of potential behaviors? A behavior map for the office (as opposed to a traditional floor plan)? Gordon, I think it’s a combination of things. The overarching ideas is that it is important to ask the detailed questions around the activities that are happening, rather than grouping them under the blanket term of collaboration. This can happen through traditional survey methods and focus groups, as long as the line of questioning is specific. Observations and behavior maps are also a great start to this discovery process, but it also must be combined with a discussion around how work and interactive activities should be and will be happening in the future.